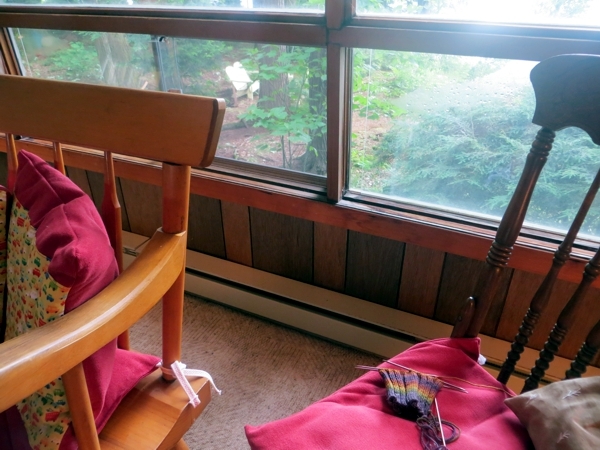 Step aside, city porch knitting: it's time for the lakeside cottage. Maybe. 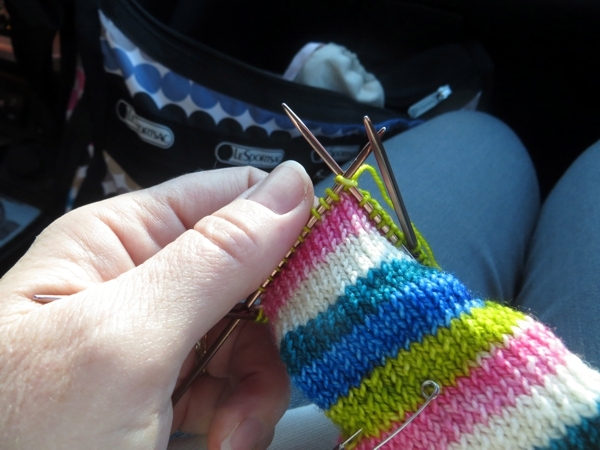 Cottage knitting also means in-car knitting: bonus! The whole cottage thing is one of those Canadian traditions that, like hockey, kind of escaped me growing up. True, my aunt and uncle had a cottage (the one we have today) and invited me up for a week every summer until I hit sixteen, started working, and couldn't get away long enough. But it seems that all I grasped was the fascination of standing in the lake looking at shells with living things inside them, and baking brownies with my cousin unsupervised. Our neighbours on either side have had their places for many, many years - three generations and four, respectively - and they totally get the cottage thing. On one side it's tons of boating, and on the other it's a really cool firepit for roasting corn and marshmallows en masse. Across the road from us - newer to this neighbourhood but not to the family cabin - there's a weekly bonfire to which all are invited. Pure cottage. By which I mean: pure bugs. This is where the multiple-generations thing helps a lot. See, it never occurred to me before we bought the cottage ourselves that I only ever visited in AUGUST. 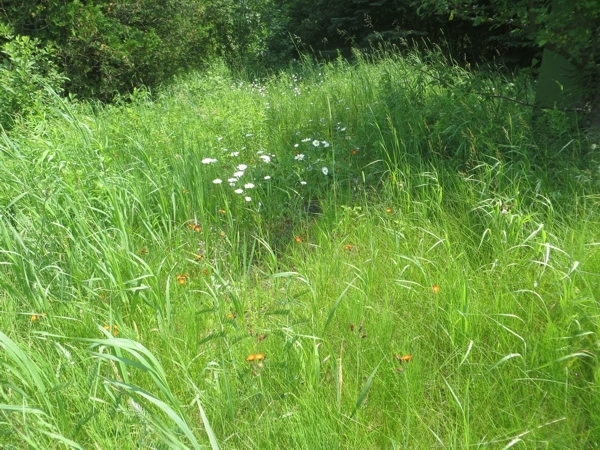 In August, most of the blackflies and mosquitoes have been Dragonfly Lunch already. 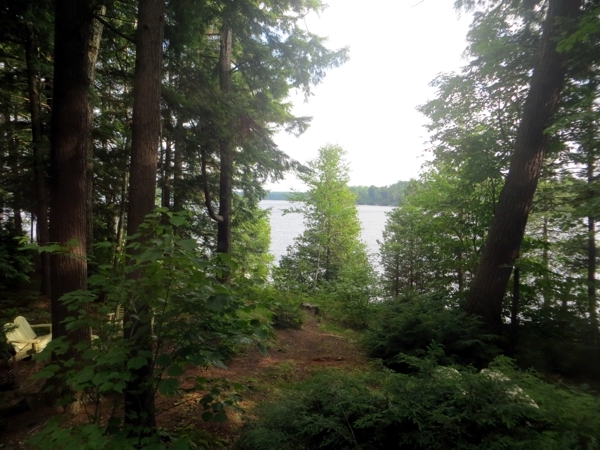 In May, June, and July on the other hand, the cottagers are Blackfly and Mosquito Lunch. Our more established neighbours are not stopped by this. They swat and wave and persist in the outdoors. I am pretty sure they have more resistance to bites, too. Me? 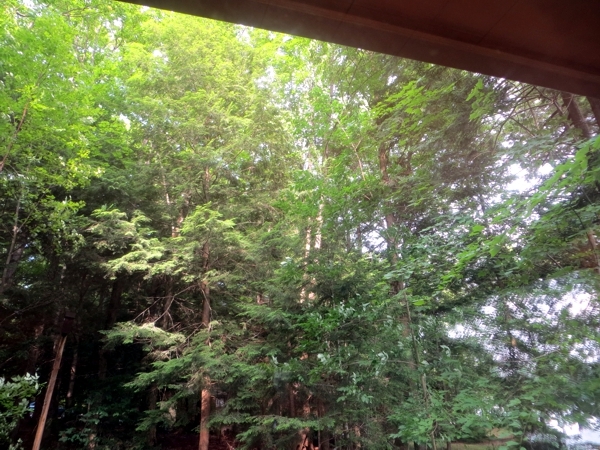 All I have to do is step past the sliding screen door and I'm being devoured,which is a problem because there is a strong tradition where I live: get to a cottage for Canada Day. Not only is this an exceptional year for biting insects thanks to the nature of last winter, the celebration stretched out over four days this time thanks to July 1 falling on a Tuesday. Sunday afternoon after observing the strong breezes that supposedly whisk bugs away I thought: Surely now I am safe. And I went swimming. And came back into the cottage with new bites on my legs and elbows. I didn't sleep that night - too itchy, even after bite relief remedies. 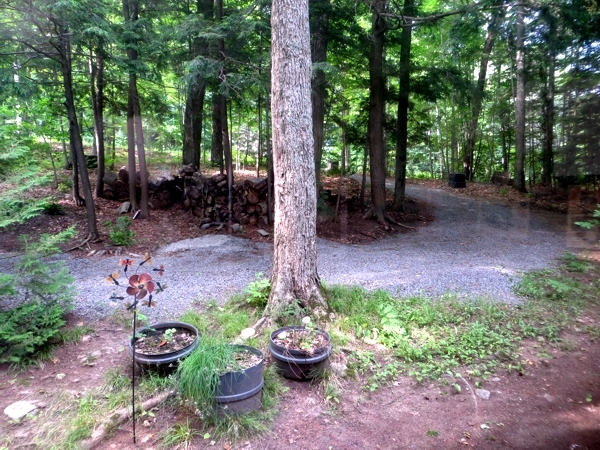 The view from the rocking chair where I knit and spin - inside. Monday Pete said, What's the difference between 72 bites and 74? So I went swimming again, and came back inside with three new bites on my ankle. That night, before another round of not sleeping from the pain, I opened our bedroom curtain and saw an actual swarm of mosquitoes throwing themselves at my reflection, settling onto the glass as though they could bite me through it and then flying backward in frustration only to be replaced by another cluster of their brethren. It was as mesmerizing as it was horrible but when I called Pete over to look he just said, "Those guys are such jerks." Tuesday I was steadfast about not going out swimming... until Pete pointed out that the lake is the one thing we have at the cottage but not at home. More bites, this time through the board shorts I foolishly thought would offer protection. I mean, you can't use bug spray to swim - it just washes off and can't be good for the fish. Sometimes you get lucky and find a dragonfly friend for protection, but then they get distracted by mating and suddenly your wide-brimmed swim hat just isn't cutting it any more. 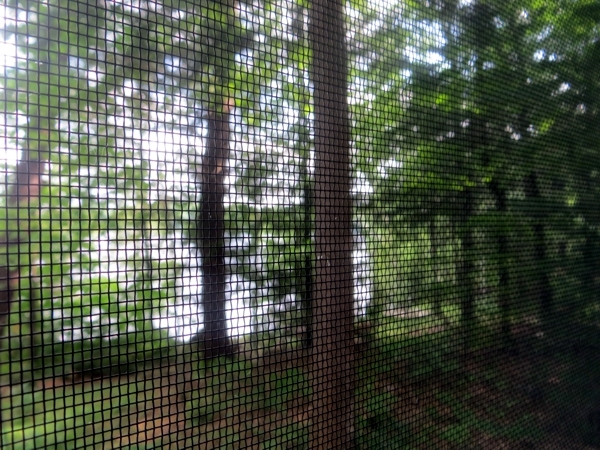 Window screens: the people who settled this part of Ontario did not have them. GAH. I guess I shouldn't be surprised the bugs are so densely represented, because after all, these cottages were built inside a forest. I mean, there is a reason that Off! called their heavy-duty product Deep Woods. 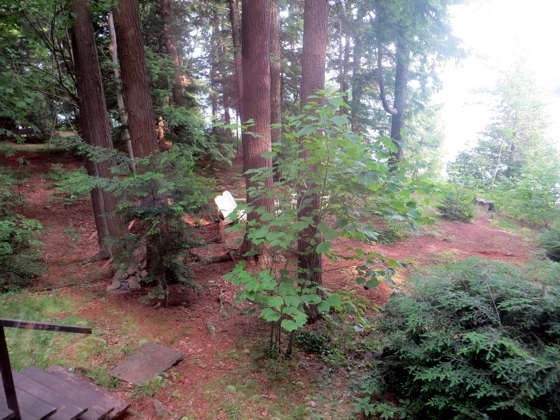 Fortunately, thanks to the miracle of giant picture windows with sections that open up for air flow, it's possible to enjoy almost all of the cottage's bucolic setting from safely inside. With knitting, of course. 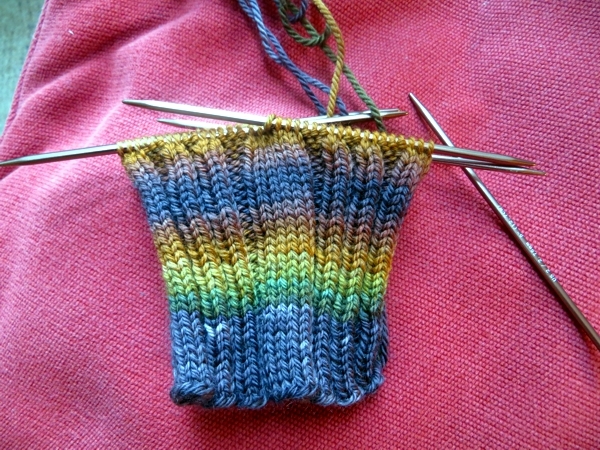 Not that you can make very much progress on a sock when you're scratching. This weekend: we're staying home, where there are only ever one or two mosquitoes floating around the porch and even those don't show up until 8pm or so. Hopefully the cottage dragonflies can get seriously busy while we're gone and maybe I can find an inpenetrable wetsuit before it's time to go back. Meanwhile, today is July 4th which I know is dear to the hearts of many many Hugs readers. I hope you guys have a wonderful bug-free holiday and that I see you back here on Monday!